“I call on the political sectors of the country to condemn the use of terrorist methods to impose their position,” president of the National Constituent Assembly Diosdado Cabello said. 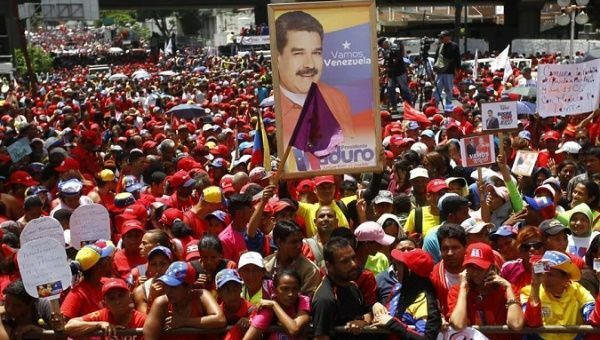 August 13 (teleSUR) The forces of the Bolivarian Revolution and the people marched Monday in favor of peace and in rejection of the assassination attempt that took place on Aug. 4 against Venezuelan President Nicolas Maduro. With joy, enthusiasm people marched as part of this mobilization that supports peace and rejects violence. The announcement was made by Diosdado Cabello, the vice president of the United Socialist Party of Venezuela (PSUV) and also president of the National Constituent Assembly when affirming that politics should condemn the use of terrorist methods to impose its position. #Venezuela | Thousands gather to protest against the assassination attempt on President @NicolasMaduro and in favor to the Bolivarian Revolution. He added that Venezuelan politics must reject the use of terrorism as a tool of political ideas. “As it has been very complicated (for the right) to win elections against the Bolivarian Revolution, there is no other option but to resort to terrorism,” he argued. On Aug. 4, President Maduro was the victim of an assassination attempt using drones loaded with explosives during a military event in Caracas. Since then national and international leaders and movements have rejected the attempt on his life and the Venezuelan people have reiterated their support and defense of the country’s leader.